Quiet has a generous collection of Uniforms to unlock in MGS 5. I have now unlocked all of them including the high level Gold, Gray XOF and Sniper Wolf skins. In this post I'll include details showing you how to unlock each of Quiet's uniforms in addition to screenshots and videos for each of them. As you probably know, Uniforms appear in the Development section of the iDroid, with some having unlock requirements before they'll appear. It then takes the right amount of GMP, R&D and other prerequisites before you can develop the new Uniform. Each Uniform also takes a set number of minutes to fully unlock before becoming selectable in the output screen. The first three Uniforms for Quiet; Blood, Silver and Gold; each require a certain Bond threshold. This Bond level is shown next to the Buddy on the mission score screen among other places. 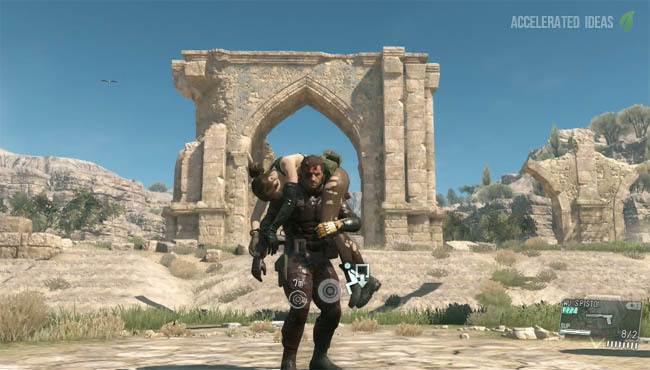 Consistent use of a buddy to complete missions will increase the buddies bond with Big Boss. Similarly any negative actions will decrease the value, such as accidentally shooting your buddy, replacing them during a mission for another buddy and many other negative events. As long as you stick with Quiet for a handful of missions then the Bond will soon rise to the maximum value (100). 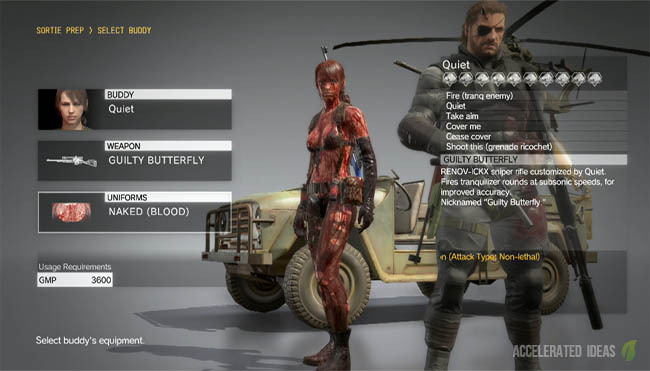 Besides the default naked uniform, the Blood uniform is the first unlockable skin for Quiet. It's a truly blood splattered skin which according to the in-game description will incite fear into the enemy (although it's unclear if this is true or not). The skin is unlocked and available for development once you increase the bond level with Quiet to at least 30. R&D level must be at least 15 and you need 186,000 GMP. The first of the shiny uniforms for Quiet is the Silver variation. This uniform changes the entire appearance for Quiet, changing her into a metallic femme fatal. This effect alters both her skin but also her clothes absorb the Silver colour too. The Silver uniform is available once you increase the bond with Quiet to at least 70. It also requires an R&D level of 19 in addition to 350,000 GMP. The third tier metallic skin for Quiet is probably my favourite in The Phantom Pain. Similar to the Silver skin, this uniform changes Quiet's entire appearance so that it's Gold with a shiny coating. 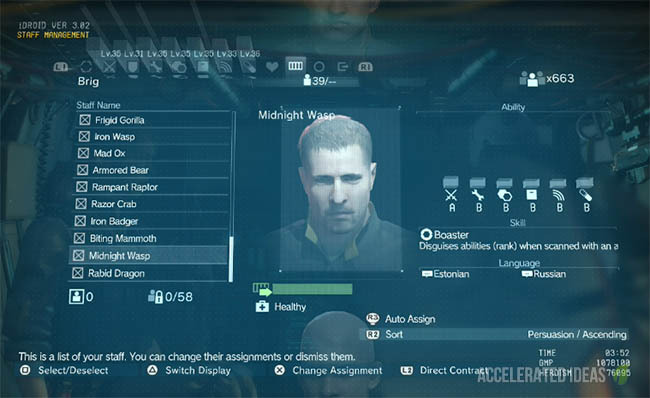 The uniform is only available once you reach the maximum Bond level (100) at which stage you will have used Quiet for a fair number of missions. A hefty 570,000 GMP and an R&D level of 22 are also requirements. Furthermore the Gold skin also takes a long time to develop; the same amount of time as the Gray XOF (72 mins). The first of the secret uniforms for Quiet, Gray XOF is a uniform that's unlocked late in the game once you reach the mid 30's. It's a Grade 5 Uniform (which is the same as the Gold skin) and it's also the most expensive of all of Quiet's Uniforms. Note: The Mine Clearing Side Op was only necessary because it was blocking Side Op 143 from appearing on the Side Ops list. As soon as the cutscene with Quiet had ended, the Gray XOF Uniform was available in the Development screen. Costing 670,000 GMP the uniform also requires an R&D level of at least 25. By far the hardest uniform to unlock for Quiet. 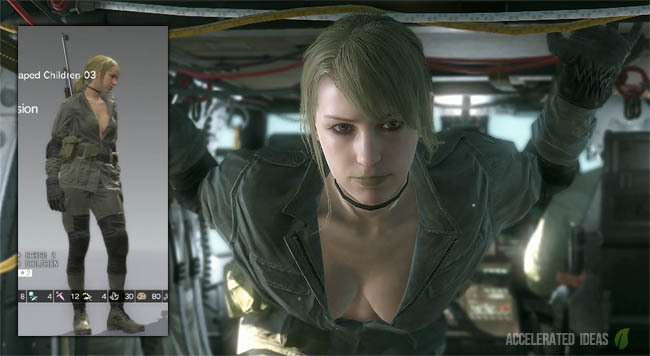 Sniper Wolf is a reward for completing Mission 40 (Handkerchief item), very late in the game. This mission is one of the harder difficulty missions in the game and in this case it's actually Extreme difficulty. The mission is in fact a replay of the Boss fight with Quiet but with an insanely high difficulty. If you thought Quiet was tough before then get ready because Mission 40 takes many attempts to get right. She can aim and shoot in a split second, giving you only a narrow window to take her down. 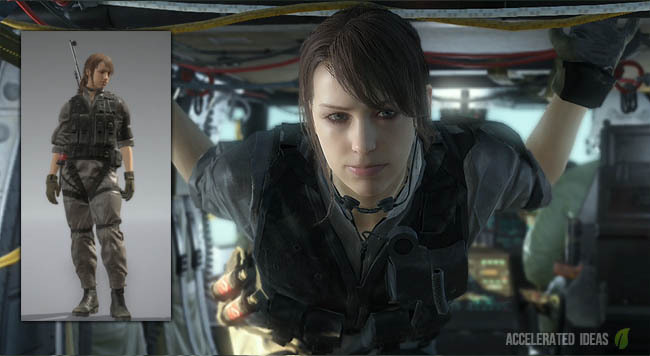 Kojima actually chose to switch Quiet's uniform for the Mission 40 boss fight too. If you get close enough to her during the mission, you'll see that Quiet isn't wearing the default bikini as she did in Mission 11. 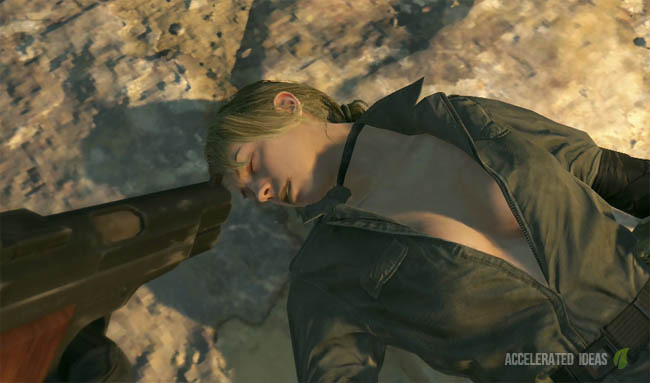 What's even better is you get a replay of the cutscene but with Quiet's Sniper Wolf skin instead. Requirements for developing Sniper Wolf are 450,000 GMP and level 23 in R&D.